Thyroid hormone (TH) promotes expression of peroxisome proliferator-activated receptor gamma coactivator-1 alpha (PGC-1a), which mediates mitochondrial biogenesis and oxidative capacity in skeletal muscle (SKM). Skeletal myocytes express the type 2 deiodinase (D2), which generates T3, the active TH. 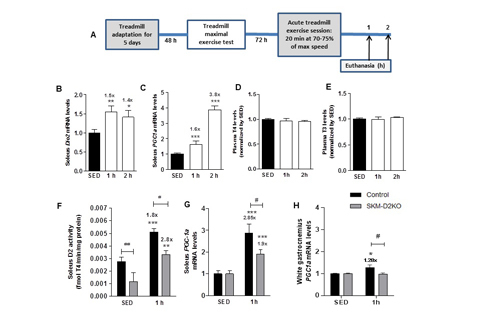 To test whether D2-generated T3 plays a role in exercise-induced PGC-1a expression, male rats and mice with SKM-specific Dio2 inactivation (SKM-D2KO or MYF5-D2KO) were studied. Acute treadmill exercise session (20 min at 70-75% of maximum aerobic capacity) increased D2 expression/activity (1.5-2.7-fold) as well as PGC-1a mRNA levels (1.5-5-fold) in rat soleus muscle (SOL) and white gastrocnemius muscle (WG) and mouse SOL muscle, which was prevented by pre-treatment with 1 mg/100 g bw propranolol or 6 mg/100 g bw iopanoic acid (5.9- vs. 2.8-fold; P < 0.05), which blocks D2 activity . In the SKM-D2KO mice, acute treadmill exercise failed to fully induce PGC-1a in SOL muscle (1.9 vs. 2.8-fold; P < 0.05) and in primary SKM-D2KO myocytes there was only limited PGC-1a response to 1uM forskolin (2.2-fold vs. 1.3-fold; P < 0.05). Chronic exercise training (6 weeks) increased SOL muscle PGC-1a mRNA levels (∼25%) and the mitochondrial enzyme citrate synthase (CS; ∼20%). In contrast, PGC-1a expression did not change and CS decreased by ∼30% in SKM-D2KO mice. SOL PGC-1a response to chronic exercise was also blunted in MYF5-D2KO mice. In conclusion, acute treadmill exercise increases SKM D2 expression through a beta-adrenergic receptor-dependent mechanism. The accelerated T4-to-T3 conversion within myocytes mediates part of the PGC-1a induction by treadmill exercise and its downstream effects on mitochondrial function. Thyroid hormone activation by type-2 deiodinase mediates exercise-induced PGC-1a expression in skeletal muscle.